Now that you have installed the BVE simulator, you need to install a route and train before using it! For this example, we're going to install the Birmingham Cross-City South route for BVE 4. Click this link, to open the Birmingham Cross-City South download page in a new tab (or window). /\ On the Trainsimcentral train download page, scroll down and click "DOWNLOAD CLASS 323 UN-REFURBISHED (WIDE VIEW)". < Now, ensure that ALL the contents of the archive are selected (in this case, the 'Railway' folder), and then click the 'Extract' button. < Click the browse for folder button on the right (labelled '...'). < Now verify that the correct folder is listed in the 'Copy to:' box (again, your drive letter may differ), and click 'OK'. ** Now you need to install the Class 323 Cab View, and you can also install any other Cross-City files you downloaded. For the class 323 EMU, simply follow any on-screen instructions provided by the installer, and accept any default installation paths. 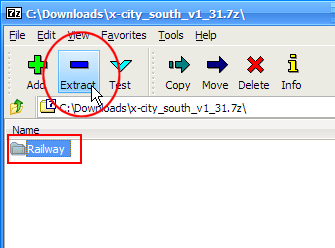 For other optional Cross-City South downloads, follow the same procedure as you followed with the main Cross-City South download. If you have followed these instrucutions correctly, you should now be ready to run your first route! Start BVE by going to your Start Menu, and finding All Programs > mackoy > BVE 4. /\ When BVE starts, it will automatically show you a standard Windows 'File Open' dialog - you use this to load the route (or activity) you wish to drive, and routes are opened/loaded in BVE just like a document is loaded in a word processor. 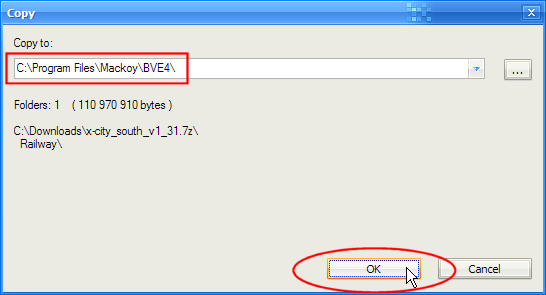 In the directory listing window, navigate to the folder where you chose to install the Cross-City South downloads, for example 'C:\Program Files\mackoy\BVE4\'. Note: If you don't see a 'File Open' dialog appear when you start BVE, please check that you have the latest version of BVE 4 installed. If you do, then simply right-click anywhere within the BVE 4 window, and select 'Open...' from the context menu. 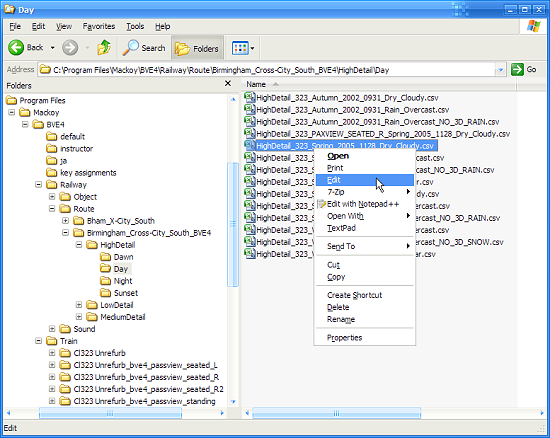 In the installation folder, you'll see a 'Birmingham_Cross-City_South_BVE4' folder; open this folder and you'll see 'HighDetail', 'MediumDetail' and 'LowDetail' folders - enter the appropriate folder based on your PC's speed and power (more information on system requirements is available in the documentation included with the Cross-City South). Vista Users: If the filenames are being cut short by the width of the 'Name' column, click the button circled in red, select 'Details', and then resize the 'Name' column. Now just click the "Open" button, and you're ready to go! < After a short time which may vary depending on the speed of your PC, you should find yourself sitting in the cab of the class 323 25kV AC EMU, ready to prepare your train for departure from Redditch. You may wish to visit the Rail Sim Routes UK Driver's Guide for BVE to find out more about signalling, understand the lineside signs you'll see, and also to read the Class 323 / Cross-City South Tutorial. 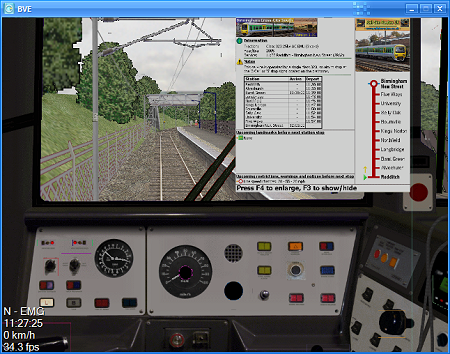 For further information and explanations of the above features and systems, please read the Rail Sim Routes UK Driver's Guide and the Cross-City South / Class 323 EMU Tutorial. < Right-clicking anywhere within the BVE window will bring up a context menu. You can use the options on this menu to set preferences, such as the BVE drawing distance via the "Graphics Settings" option, or the display settings via the "Display Mode Settings" option. 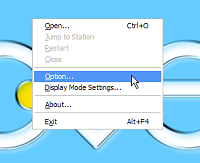 The "Jump to Station" submenu allows you to place the train at a specific station along the route. Jumping to a station will also place you there at the correct arrival time. Depending on the train you're using, you may need to reset the safety systems on board the train after jumping to a station; see the Cross-City South / Class 323 Tutorial for more information. The first thing you may wish to do, is change the 'Viewing Distance' - how far ahead of you the scenery is drawn. The greater the viewing distance, the better a route looks, but at the expense of performance. On BVE 4's context menu, select the 'Option...' menu item - the 'Graphics' tab of the Options dialog will show. Experiment with this option until you find a balance between graphical quality and performance, which you are happy with. If your video card doesn't fully support the fogging effects that BVE uses, then you can disable this by unchecking the "Fog" checkbox. 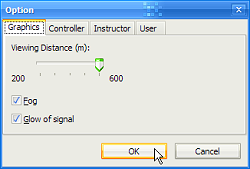 If you see odd looking coloured circles where signal aspects should be, you can also try unchecking the "Glow of signal" option. 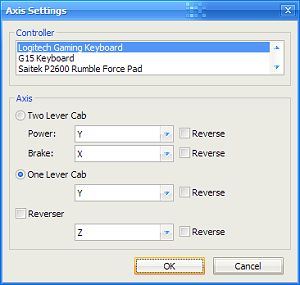 Use the Controller tab to configure your keyboard and joystick for use with BVE. Personally I recommend using your keyboard, but if you have a throttle quadrant you may wish to use this with the Cross-City South and the class 323, as it is not dissimilar to the 323's combined power/brake controller! Important Note: It is strongly recommended that you do NOT use any key assignments other than the 'Default' profile - this will ensure compatibility with trains and also the instructions given in BVE keyboard layout guides! If you want to use a joystick with BVE, you can use the Axis Settings dialog to configure your controller - you may wish to experiment to see how well it works. I'd recommend keyboard use, but if you have a throttle quadrant you might want to configure the 'One Lever Cab' to be controlled by the 'Z axis' (your throttle axis) - this might be ideal for trains like the class 323 EMU, for example. 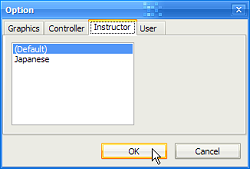 Use the Instructor tab to configure the language that BVE's driving tips and warnings are displayed in. (Default) is the English language option. 'F5' key - Reload Route on the fly [If you reload a route, performance, framerates and overall smoothness may be degraded!]. 'Ctrl+M' keys (Viewer Mode) - Enables 'Viewer Mode' - this is BVE v4's substitute for the extremely useful Track Viewer utility available with BVE 2. In BVE 4's Viewer Mode, you can freely pan the camera around and explore a route without having to drive along it (very useful for positioning 3D objects during route construction, or taking screenshots), although performance will degrade if you reload a route several times. 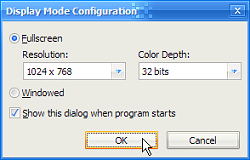 Use this dialog to specify whether BVE runs in a 640x480 window on your desktop, or runs full screen in 640x480, 800x600 or 1024x768 mode. The latter is recommended, to have BVE fill the entire screen, BUT - if you task switch (Alt+Tab) away from BVE while it's running in fullscreen mode, you may not be able to restore the 3D view again, in which case you'll have to restart BVE4. Note: A fantastic open source utility called BVE Resolution Changer is available (created by the same developer behind openBVE, before the latter was written), which patches the BVE executable to allow it to run at resolutions higher than 1024x768, in any aspect ratio you choose. If you use a high resolution display greater than 1024 pixels wide, you can enable BVE 4 to take full advantage of your monitor and run at it's maximum recommended resolution. You can download the Resolution Changer from Richard Helliwell's BVE Routes & Trains site (in the 'Misc' > 'BVE Tools' section), and you can also visit this RailUK Forum thread for comments by the developer of the utility. "<Path>\ObjectFile(LineNumber) : Input string was not in a correct format. : Object.Command x;x;x;x;x,"
This occurs because BVE routes are in fact CSV (Comma Sperated Values) format files, and BVE expects full stops to be used as decimal seperators within the route files. In some countries, a comma is used instead of a full stop as a decimal seperator - BVE get's confused under these circumstances and is unable to parse the route file correctly, leading to a long list of errors. Go to Start Menu > Control Panel > Regional and Language Options; (or in Windows Vista: Start Menu > Control Panel > Clock, Language, and Region > Regional and Language Options). In the combo-box listing your language and country, near the top of the dialog, select 'English (United Kingdom)'. Now, click OK. Note: You may have to reset your regional settings to your own country after using BVE, depending on what other software you use. On the Regional and Language Options tab, click the 'Customise this format...' or 'Customise' button. 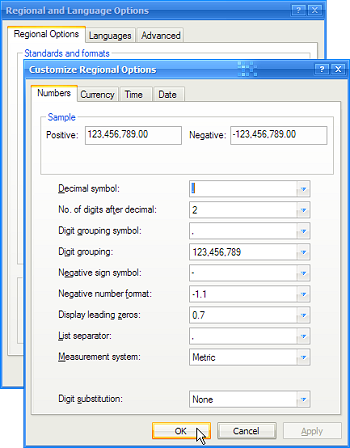 Click OK, and OK again on the Regional and Language Options control panel. Note: You may have to reset your regional settings to your own country's default settings after using BVE, depending on what other software you use. The routes you select within BVE's Route and Train Selection Screen are text files, which amongst other things, specify which objects are loaded, and where they are placed to create the route. 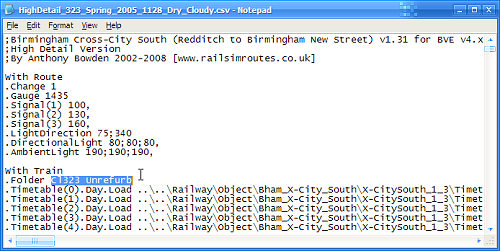 However, the route file also specifies what train BVE should use for driving the route. The line of text which specifies the train, can be easily changed, meaning you can use any train you have installed to drive your favourite route. The popular BVE "Passenger Views" are also BVE trains in their own right and you drive them like any other train, so this guide applies to using passenger views as well. This can be done automatically by using Oskari Saarekas' excellent BVE Route Randomiser, now available here: http://www.trainsimcentral.co.uk/misc.htm. Using BRR, you can select a route file, then select a train from a list, and then have BRR make all the changes and run BVE for you. 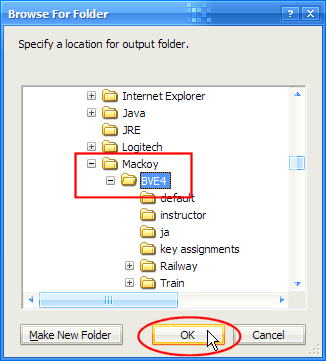 Firstly, using Windows Explorer, locate the folder in which your BVE routes are installed (usually "C:\Program Files\mackoy\BVE4\Railway\Route\"). The folders and files you now see, should look familiar - they're the same files you see in BVE's 'File Open' dialog. Note how the new text is identical to the train's folder name in the above screenshot. Now save the 'HighDetail_323_Spring_2005_1128_Dry_Cloudy.csv' file (or save it with a new filename so the original file is left unchanged, but ensure the file is saved somewhere in the 'BVE4\Railway\Route\' folder), and when you try to load this route file in BVE, you'll be driving the class 323 passenger view seated on the left, rather than the cab-view class 323. In Vista, the 'Program Files' directory is Read-only protected by Vista's User Account Control (UAC) feature; if you try to save any edited files in this folder tree, such as a BVE route file, you will be denied permission to do so by Windows. 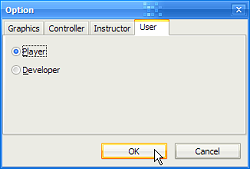 You may have to temporarily disable UAC in order to save the file; only do so if you are aware of the risks involved in doing this - if so, go to 'Start' > 'Control Panel' > 'User Accounts and Family Safety' > 'User Accounts'; then select your username, and click 'Turn User Account Control on or off', uncheck the checkbox which appears, click OK, and reboot when prompted. I recommend you turn UAC back on once you're done, following the same procedure. 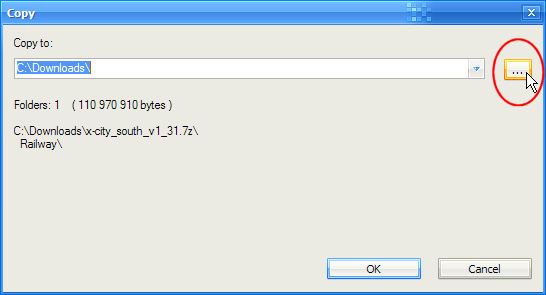 Alternatively, you can re-install BVE 4 and it's add-ons in a folder outside of the 'Program Files' directory. Hopefully, you should now be using BVE successfully!